The Uechi Ryu Karate Do family lost one of its most significant members on February 26, 2018 with the passing of Master Peter McRae. Peter was eloquently eulogized privately and publicly throughout the course of his wake and funeral. Rather than eulogize, I would like to pay tribute to a life truly well lived. 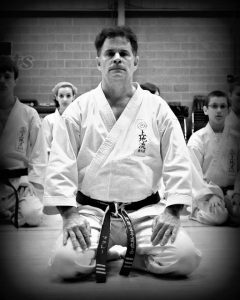 Peter joined my dojo 47 years ago as a teenager and progressed through the ranks ultimately acheiving his 9th Dan rank in 2013. He founded his dojo in Plymouth, Massachusetts in 1972 and provided a positive example for all he touched, in and outside of his dojo. As Uechi Ryu practitioners, we pause at the threshold of our dojo signifying for the duration of that class our minds will be focused solely upon our practice. At the conclusion, our teacher says "Go Kuro Sama" sometimes translated as "Thank you for doing what was expected of you". As we exit the dojo we pause again, reclaiming the distractions abandoned on the way in and hoping to have more success in dealing with them. There is "karate" and there is "karatedo". Karate is just physical training, "do" means "way" as in way of living. Peter's way of living extended the principles of his dojo into every facet of his life. In all that he was, husband, father, student, teacher, friend, skier and sailor, Peter did what was expected of him. Truly, he made the world his dojo. One of my favorite quotes is, "The reflection of the moon is not the moon" Peter McRae was the real deal, he was the moon. Go Kuro Sama Peter, rest in peace.